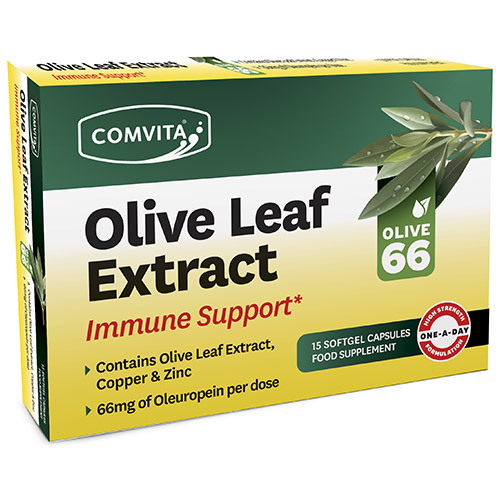 Olive Leaf Extract High Strength Softgels contain olive leaf extract, copper, zinc and provides 66mg of oleuropein per dose. 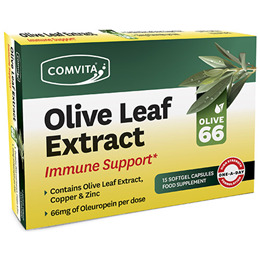 Comvita Olive Leaf Extract is made from fresh picked Australian olive leaves. An effective dietary supplement that supports the body`s natural defence system against winter ailments and promotes year-round health and vitality. Olive trees have long been recognised for their health benefits. The olive tree traditionally represents peace, happiness and success. There are over 200 Biblical references to the olive, indicating that its use dates back to ancient times. Olive oil has been shown to contain active compounds called polyphenolics. These polyphenolics have also been identified in olive leaves, but at a level 30 times higher than in extra virgin olive oil. The three most widely researched olive polyphenolics are hydroxytyrosol, caffeic acid and oleuropein. These compounds are partly responsible for the exceptional antioxidant activity of olive products. Olive oil, Olive (Olea europaea) leaf extract, Gelatin (bovine), Glycerol (bulking agent), Zinc gluconate (providing elemental zinc), Soy lecithin (emulsifier) Caramel (colour) Water, Beeswax (stabiliser), gopper Gluconate (providing elemental copper) Silicon dioxide (anticaking agent), Xanthan gum (thickener) Titanium dioxide (colour). Adults take one softgel per day. Take with food. To retain the integrity of this product, please store below 30°C. Below are reviews of Comvita Olive Leaf Extract - High Strength- 15 Softgels by bodykind customers. If you have tried this product we'd love to hear what you think so please leave a review.